Fast approaching the 47th National Day of UAE, along with many buildings, places already decorated with colours and lights, the citizens of Dubai rush towards the stores for buying some for celebrating the festival. 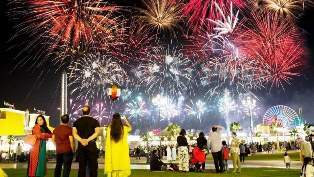 If you are not able to plan travel to watch the firework which will be organized on National Day then don’t worry, now will be seen at 4 different places in UAE. At La Mer in Dubai, the firework will perform with a music concert. The light of the firework will decorate and blaze the sky, the famous singer will live to perform on this occasion. You can enjoy all these festive on 1 and 2 December at 9 pm. You can also enjoy all these at the Beach, JBR on December 1 and 2 at 8 pm till 20 minutes, all these activities will start from the 30 December. Along with the special dance performance by Ayala and the fireworks show on December 1 and 2 at 8 pm to 10 pm which will start from 2 pm at Dubai Festival City Mall. The colours of the UAE flag will fascinate you.